Digital Surrogates from the Accessibility Standards Project File contain digitized meeting minutes, reports, membership rosters, letter ballots rules and responses, memorandums, and published booklets, concerning the progress of the National Program to Eliminate and Prevent Architectural Barriers to the Handicapped, and the activities of the American Standards Association Steering and Sectional Committees, formed in 1959 to work on making buildings and facilities accessible and usable to people with disabilities (Project A 117). Digitized material also concern trends and developments in equipment and devices for people with disabilities, and American Standards Association history. Major correspondents and significant names include Timothy J. Nugent (Assistant Professor and Director of Student Rehabilitation Center), Melvin J. Mass (Major General), David Henry (University President, 1959), Leon Chatelain. Jr, and J. W. McNair (Technical Director of American Standards Association). Materials were digitized by the Digital Content Creation Unit in 2011. 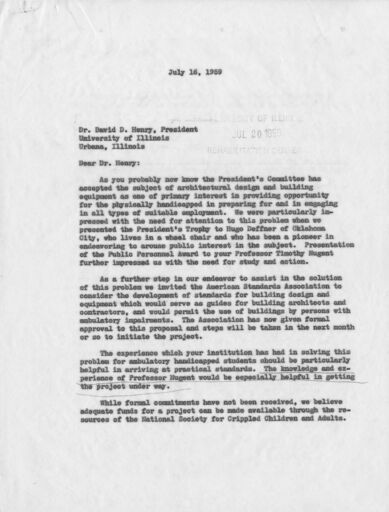 The Accessibility Standards Project File (Digital Surrogates), 1959-1964 are managed by the University of Illinois Archives and do not feature precise descriptive information for each item. Discover their contents by browsing the folders and files. For more information, contact an archivist at illiarch@illinois.edu.